In this post, we talk about Python web scraping and how to scrap web pages using multiple libraries such as Beautifulsoup, Selenium, and some other tools like PhantomJS. In this post, we will talk about Python web scraping and how to scrape web pages using multiple libraries such as Beautifulsoup, Selenium, and some other magic tools like PhantomJS. 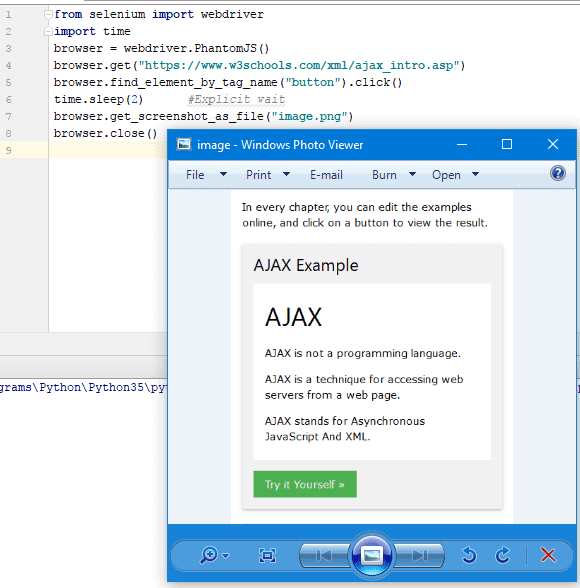 You'll learn how to scrape static web pages, Ajax loaded content, iframes, how to handle cookies, and much more. Web scraping is the process of extracting data from the web, you can analyze the data and extract useful information. Also, you can store the scraped data in a database or any kind of tabular format such as CSV, XLS, etc., so you can access that information easily. In short, web scraping is downloading web data in a human-readable format so you can benefit from it. You might wonder, why I should scrape the web since I can just use Google? Well, we don't reinvent the wheel here. Web scraping is not for creating search engines only. You can scrape your competitor's web pages and analyze the data and see what kind of products your competitor's clients are happy with from their responses. All this for FREE. A successful SEO tool like Moz scraps and crawls the entire web and processes the data for you so you can see people's interest and how to compete with others in your field to be on the top. These are just some simple uses of web scraping. The scraped data means money. I assume that you have some background in Python basics, so let's install our first Python web scraping library, BeautifulSoup. To install Beautifulsoup, you can use pip or you can install it from the source. If it runs without errors, that means BeautifulSoup is installed successfully. Now, let's see how to use Beautifulsoup. We use the urlopen library to connect to the web page we want then we read the returned HTML using the html.read() method. The returned HTML is transformed into a BeautifulSoup object which has a hieratical structure. Well, the last thing we need to check for is the returned tag. You may type the incorrect tag or try to scrape a tag that is not found on the scraped page and this will return a None object, so you need to check for a None object. But what about deeper hunting? Now let's try to be selective by scraping some HTML elements based on their CSS classes. Then we can use a for loop to iterate over them and do whatever with them. This code returns all h3 tags with a class called post-title where these tags are the home page post titles. We use the getText function to print only the inner content of the tag, but if you didn't use getText, you'll end up with the tags with everything inside them. We saw how the findAll function filters tags by class, but this is not everything. This code extracts all anchor tags that have a "readmorebtn" and "url" class. This line will get the first span element on the BeautifulSoup object then scrape all anchor elements under that span. This line gets the nav element with id "site-navigation" then we grab the fourth anchor tag from that nav element. BeautifulSoup is a powerful library! In a previous post, we talked about regular expressions and we saw how powerful it is to use regex to identify common patterns such as emails, URLs, and much more. Luckily, BeautifulSoup has this feature. You can pass regex patterns to match specific tags. The regex engine makes it so easy to achieve such jobs. I love Python web scraping. This is just a simple example to show you the power of regular expressions combined with BeautifulSoup. Suppose that the page you need to scrape has another loading page that redirects you to the required page and the URL doesn't change or there are some pieces of your scraped page that loads its content using Ajax. Selenium library doesn't include its own browser, so you need to install a third-party browser (or Web driver) in order to work. If you install any of these drivers, let's say Chrome, it will open an instance of the browser and loads your page. Then you can scrape or interact with your page. Then you should download Chrome driver from here and apply it to your system PATH. We didn't interact with page elements, so we didn't see the power of Selenium yet, just wait for it. You might like working with browser drivers, but there are those who like running code in the background without having to see it running. Also, you can use it like BeautifulSoup to scrape pages and elements inside those pages. 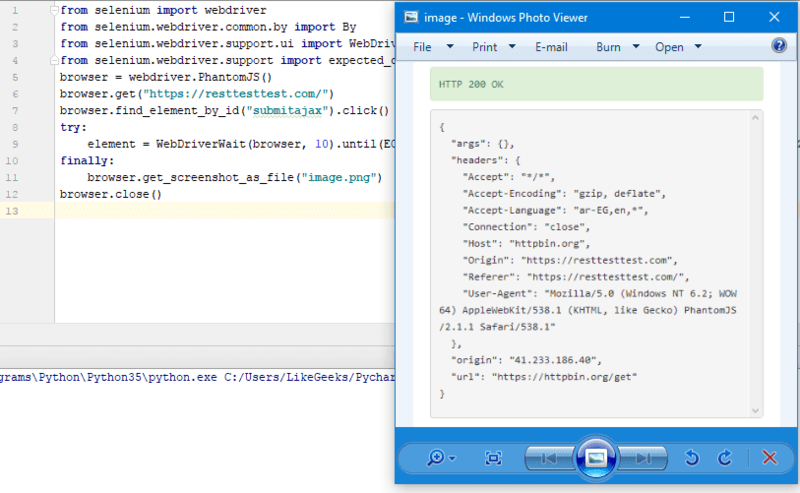 Now, let's use selenium with PhantomJS the same way as Chrome web driver. Awesome! It works very well. Do you feel the power of Python web scraping? Let's see more. If you try to scrape a page that contains an iframe, you won't get the iframe content, you need to scrape the iframe source. You can use Selenium to scrape iframes by switching to the frame you want to scrap. Check the current URL, it's the iframe URL, not the original page. You can get the URL of the iframe by using a find function and then you can scrape that URL. Awesome! This is the power of Python web scraping. You have many options. There is one little thing here, it's about the wait time. We check for div element text if it's "HTTP 200 OK" with 10 seconds timeout, then we save the result page as an image as shown. Sometimes, it's very important to take care of cookies for the site you are scraping. A lot of scenarios out there, so let's see how to handle cookies. We talked about Python web scraping and how to parse web pages, now some people get confused about scraping and crawling. Web Scraping is the parsing of web pages and extracting data from it for any purpose, as we saw. Web crawling is about harvesting every link you find and crawling every one of them without a scale, and this is for the purpose of indexing, like what Google and other search engines do. I hope you find the post useful. Keep coming back.